All the resources you need to start making payments. Want to get up and running quickly? 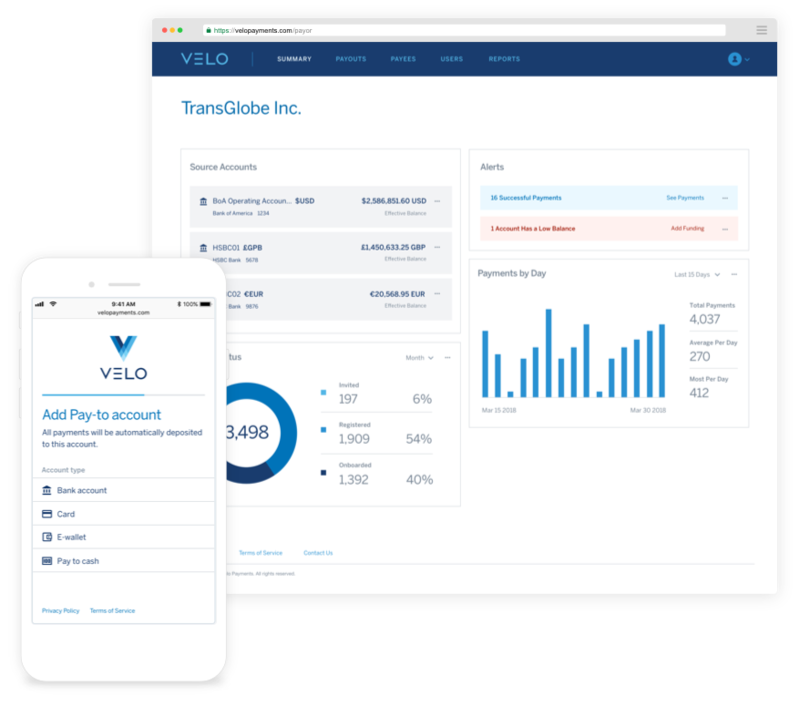 The Velo Payor Portal provides a browser-based experience where your users can onboard and manage Payees, manage funding, instruct and track payments and more. For clients who require deeper integration we provide a full API with all the same capabilities. Want your ERP system to automatically instruct approved payments for you? 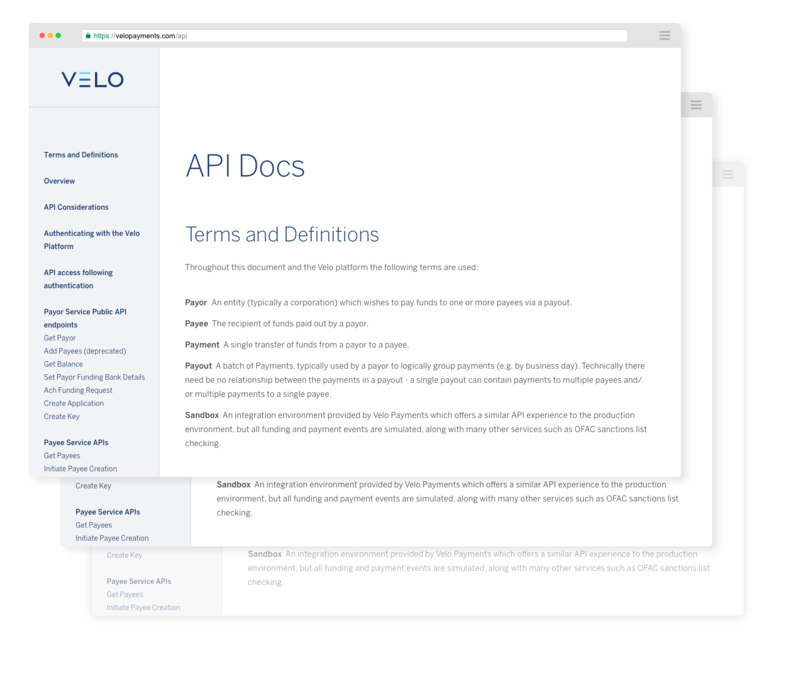 See our ERP Connectors & API documentation below. With either approach you benefit from the Velo Payee Portal which lets your suppliers manage and track the payments you make to them. Money transfers & account balances are simulated. This means you can try Velo out without needing to commit any money or risk accidentally sending funds somewhere you didn't mean to. Personal details checking is disabled (e.g. KYC, OFAC & fraud). Avoid GDPR and personal data restrictions by using test data. Once your Payor account is set up you can create and manage your users, configure the platform to behave as you want it, then onboard and pay some trial Payees to see how easy it is to use Velo. The Sandbox also acts as a test bed for clients writing their own integration with our API, allowing them to work out the kinks before moving in to production. When you are ready to move to production it's a simple matter of changing the base URL in your requests from sandbox to live and swapping over to your live credentials (we never share security information between the platforms). Contact Us to request access to the Sandbox. Sometimes it's helpful to see the API being used. You can find sample code using the Velo APIs to cut & paste into your own code at Velo’s GitHub site. The sample code above deliberately uses no frameworks or abstractions to make it as easy as possible to see what's going on and re-use in your own projects. We also provide language bindings which abstract away from the underlying REST calls and provide a simpler interface to interact with Velo. Every ERP installation is different, but we strive to work with clients to produce re-usable Connectors to speed up integration. Please Contact Us if you'd like to discuss integration with a specific ERP. Whether you need access to the Sandbox, help with sample code or bindings for a different language, we’re here to help with all your integration needs. There was an unexpected error while submitting your form. Please try again. © 2017-2018 Velo Payments Inc. All Rights Reserved.